RRC Group D Answer Key 2018 released. Check Official Railway Group D Answer Key 2018-19 to know your result before the announcement by RRB. Aspirants can get RRB Group D 2019 Answer Key Download link from this article. Candidates can also obtain RRC Group D Cut off Marks, Result date details. Intenders can also refer to the official website @ www.indianrailways.gov.in to get Railway Recruitment Cell RRB Group D Answer Key 2019, result Details. Latest Update: RRC Group D Answer Key released. Candidates can get official RRB Group D Exam key and check Raising Objections Dates here. Are you one among the aspirants searching for Railway Group D 2018 Answer Key??? Here is the good news for All such candidates waiting for RRC Group D Answer Key. After completion of the RRC Group D online written exam, all the contestants wait for the result. But the Board take a lot of time for an announcement of Group D 2019 Result. Because revealing the result is a time taking process, firstly, the officials of the board should verify all the answers sheets. After that, the higher authorities should shortlist the contenders by checking whether they have reached the cutoff marks. Finally, after completion of this total procedure, the RRB release the 2019 Group D Result. So, interested candidates can verify their exam score with the help of Railway Recruitment RRB Group D Answer Key 2018. Name of the Board Railway Recruitment Cell. Examination Name RRC Group D Examination 2018-2019. Admit Card Issuing Date 13th September 2018 onwards. 2018 RRB Exam Date Group D Level 1 17th September to 17th December 2018. Status of Answer Key Released. 11th January 2019, 22:00 Onwards. Raising Objections & Fee Payment Starting Date and Time 14th January 2019, 17:00 Onwards. Deadline for Raising Objections & Fee Payment 19th January 2019, 23:59 Hours. Railway Recruitment Council published an RRC Group D Notification for various Group D Posts. Board officials are going to recruit the worthful candidates for 62,907 Vacancies. Board started the online application process on 10 February and ended on 31st March 2018. So, candidates interested in Railway Jobs applied for Group D Level 1 posts. Aspirants who are having a dream to get a job in Indian Railways can grab this opportunity. RRC follows some steps to select the eligible candidates for various posts. There are four stages in the selection procedure, firstly Board conducts an online written test, to check the marks in written exam use Group D Railway Exam Answer Key 2018-19. Qualified aspirants are allowed for the next step of selection procedure i.e, Physical Efficiency Test. Next stage is Document Verification, and finally, Medical Examination. The main reason to conduct all these stages is to shortlist the contenders. So, download RRC Group D Answer Key and check the status. RRC going to conduct RRC Group D 2018 Examination from 17th September to 16th October 2018. Examination Date and center details are clearly mentioned in the RRC Group D Admit Card 2018. After completion of the RRB CBT of Group D, candidates can check their performance in the Computer Based Test with the help of RRC Mumbai Group D Answer Key 2018. 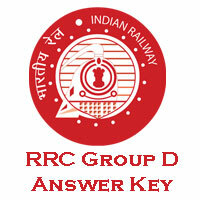 RRC Jaipur D Group Answer key will be released one or two days after the RRC Examination. Once the Answer key released we can check our marks in online/ offline. On this page, we have given the Railway Recruitment RRB Group D Answer Key PDF. Hence aspirants can calculate their score secured in the Railway Recruitment Cell 2018 Group D Examination. All type of Questions presented in MCQ type only. Negative Marking Scheme is applicable in RRB Group D exam of 1/3rd for each wrong answer. Each section will have different no of questions as described in the above table. Usually, the officials of RRC conduct exam with different sets of question papers for the adjacent contenders. Even though it is a computer-based Test (CBT), the board follow the same procedure. As the candidates are seated side-by-side, recruiters follow this method to avoid malpractice. Thus, examiners release a set-wise RRC Group D Answer Key. Now, download the relevant Railway Group D Answer Key 2019 of your set and calculate the total number of marks you might get in the online test. 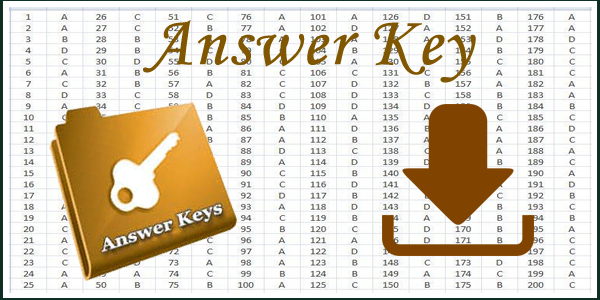 While checking your answers, if your answer is matched with the official Answer key then consider it as a right option. Otherwise, it is wrong you may consider it the wrong answer. In this way, you can calculate your marks. Depending on the total number of candidates appear in RRC Group D 2018 examination. Based on the difficulty level of the question paper. Considering the average marks of the candidates. Candidates should reach both sectional cut-off as well as category wise cut off marks details. If the aspirants do not reach any one of the cut off marks then they are not considered as an eligible candidate. In most of the cases, after two months of the conduction of RRB Group D Exam, the Board authorities release the RRC Results. As per Latest Railway news, Railway Recruitment Cell Group D Result expected Declare in February 2019. As soon as the Board declares the result date we immediately, update the information on our page. Follow our site www.rrbrecruitment.co.in to get the updated information. Until that, intenders can check their status of a result to know whether they have qualified for the exam are not through the Indian Railway Answer Key 2018. After they calculate their score check it with the cutoff marks. If you reach this cut off then you can start your preparation for further rounds. Aspirants who did not know to download Answer Key can follow the below steps to get RRB Group D 2018 Answer Key. Follow the steps correctly in the given order. so that you can easily download the RRC Jaipur D Group Answer Key. On the home page, search for Railway Group D Exam Key 2018 link. Click on that link, a new page appears on the screen. Select your set number and check the Answers. Also, take a print out for the further purpose. Intenders have to remember that, the obtained marks after checking RRC Group D Answer key is not their final score. But it gives some idea of your Result whether you have a chance to qualify the RRC Group D 2018 Exam. There may be some mistakes in the RRB Exam Key 2018. If you find any such mistakes, then candidates can send their answer proof within the mentioned dates. The officials after checking the proofs they will release the RRC Group D Final Result 2018. I’m a candidate of rrb Kolkata kindly provide me the answer key of 1 November 2018 3rd shift.